Small kitchen design and layout improvements that make a big difference! Making a real difference to your kitchen area can be a real head ache sometimes. When you don’t have bags of time, money and space, you may feel like the odds are stacked in your favour to make any meaningful change to your kitchen. Thanks to expert advice from kitchen design specialists that have spent their lives improving kitchens, you can find out some fast and easy ways to improve your cooking space. A kitchen should be considered the heart of your home. Whether you live with family, friends, a partner or alone, the proud ownership of a kitchen should be felt, enjoyed and utilised. It is the place you create tasty food, discuss your day’s events and quite often the houses main reception. Creating a warm, inviting, stylish and practical kitchen will not only earn you bags of compliments, but also allow you to feel content whilst rustling up some nice food. 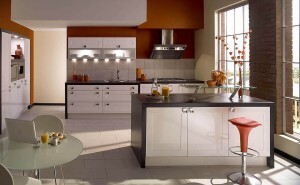 The kitchen is the space in the house where you are most creative and active. Make a point to group appliances, cupboard contents and dining equipment in a logical order and in an area that eliminates muddle around the kitchen when undertaking actions. Whether that’s cooking, finding bowls or simple covering some left over food, try and think carefully about where things should be for maximum convenience. The most marketable colour is undoubtedly white. It is a colour that can never be challenged and is constantly ranked in the top Kitchen and Bath Associations annual survey as one of the most used. White is associated with purity, peace, happiness and new beginnings – all of which have good connotations. White is a very open colour and when combined with the light within the room can create a much more airy and bigger feeling than that of its real size. An extra advantage is that you’ll spot any dirt marks a mile off, so you’ll be able to act quickly and ensure a nice, clean and sparkling kitchen. A focal point can come in all shapes and sizes. Whether it’s a splashy tile, special fancy flooring, unique kitchen cabinets, busy counter top or a specially designed interesting wall, there are a number of choices. Pick one, otherwise it can get a much, and then work on designing your kitchen in a way that compliments it with other smaller and quieter eye catching details. Greentree kitchen fitters Llandudno are a firm that can not only advise but also deliver exactly what you want in regards to your kitchen. From modern style kitchens to traditional, with bags of ideas and options, Greentree kitchens Llandudno can ensure you have a wonderful looking and practical use kitchen. Artificial Grass is becoming increasingly popular with those looking to undertake both domestic and commercial landscaping projects. There have also been a number of improvements in recent years with regards to the quality and appearance of artificial grass. Many people who dislike artificial grass are not familiar with the modern options available. They will visualise a very false looking product but these days artificial grass is very hard to tell apart from the real deal. There is a wide range of choice out there in terms of price, quality, length and appearance with some varieties obviously appearing more natural than others. Experienced Manufacturers who produce the best artificial grass use techniques to mimic real grass fibres such as mingling shades of colour, even subtle elements of brown to create a highly realistic natural appearance. If you are looking to lay your own artificial grass as part of your next big landscaping DIY project then follow our simple guide to help you along the way. The first thing to consider is are you laying on a solid or permanent base or is your artificial grass for a temporary installation? If you are only laying a temporary installation then you simply need to make sure that the surface you are covering is clean and smooth. Then all you need to do is apply a self-levelling compound before rolling out the required amounts. 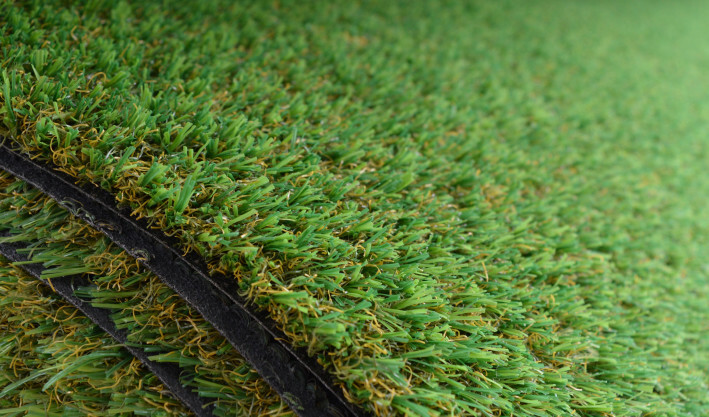 If you are just placing your new artificial grass on top of decking or another timber surface, then a combination of adhesive and carpet tracks will do the job of fixing the grass down nicely. You will require artificial grass rolls, Stanley knife, high quality outdoor tape or glue, sand mix, rake, vibrating plate or roller (if you are replacing natural grass), weed killer, geo textile weed barrier, pins. 1) Calculate in square metres the area you wish to cover with artificial grass and always buy slightly more rolls of artificial grass than you need as wastage may come in handy depending on your garden design shape. 2) Make certain the area is clean and smooth. A self-levelling compound should be used to remove surface imperfections. This is especially important is you are laying out a very short artificial grass product. 3) Lay down your artificial grass on the clean, smooth area. Be sure to allow 50mm of grass overlapping the sides of the area you want to cover to ensure a perfect edge. If you leave the grass for a couple of hours to settle you will find this removes creases. 4) Take your Stanley knife and neatly trim your grass to match the edges of your chosen covered area. 5) Now for making the joins we recommend using a high quality outdoor tape or glue. Push any grass edges together then when satisfied peel back the grass and apply the glue, tape or adhesive. Fold the grass back and if you have used glue or adhesive be sure not to squeeze too hard as this will push the glue into the grass strands. 6) Using ground pins you can nail the perimeter down every 200mm to keep it extra secure. 7) Bear in mind your new artificial grass area may require an infill. If this is the case you will need to lay down a sand mix, which has been compacted in advance. 8) Avoid leaving any vegetation underneath the new grass. 1) In the case of replacing existing grass it is very important to work out the height you wish your grass to be before you begin. 2) Take up your turf and also some subsoil depending on the height you wish your new grass to be and the height of your topsoil. It is not a good idea to add a base on top of the topsoil. 3) Try to remove any big stones from under the turf. 4) Compact the ground using a hired roller then proceed to spray down weed killer as you don’t want weeds growing up through the artificial grass. 5) Place down your geo-textile weed barrier to prevent the weeds returning across the area you wish to be covered by artificial grass. *Note that water runoff is important. Artificial grass does not absorb water in the way a natural lawn does so you want to hinder run off as little as possible. This means that if you desire a timber edging around the artificial lawn it must not be higher than the end result of the grass line. 6) You may want to put down roughly 75mm of fine type stone aggregate and compact it down. 7) Lay down a coarse sand to a depth of approximately 20mm – 40mm. Or you can use a finer stone aggregate if you prefer. Again compact this down. 8) Lay your new grass carefully on top without dragging the sand around too much. 9) Leave for the settling time as with other methods. 10) Finally cut, trim and make the joins just as you did for a solid base. * Remember that if you are laying artificial grass on a roof be sure it will bear the weight and be careful not to puncture your waterproof membrane. You can purchase in store or order artificial grass for delivery from Richard Williams Builder’s Merchants in North Wales. Call 01492 583423 for their Llandudno Junction branch or 01824 702475 for their Ruthin branch. Gardening is one of life’s most therapeutic and rewarding tasks. Cultivating your own garden gives you somewhere to get back to nature and reflect. 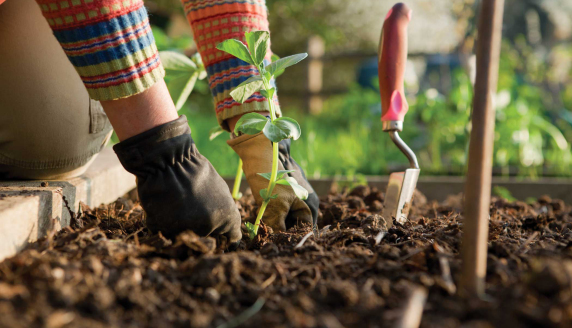 Gardening is not only good for the soul it is in fact proven to be beneficial for your health. It relieves stress and depression symptoms while also being great for your blood pressure while giving you a bit of exercise too. Gardening is great for everyone and provides a beautiful escape you create yourself. You do not need to be an expert to get involved with gardening but as a novice you may encounter some irritating aspects that horticulturalists have learnt to solve. Deterring plant eating insects like slugs and snails is just one of many little annoyances that experience gardeners know how to solve so follow these simply garden care and garden maintenance top tips to keep gardening as relaxing and productive as possible. When you are involved in the task of bulb planting you may find that sometimes your prizes flowers are dug up by wildlife before they even have a chance to germinate. To avoid this try covering bulb areas with chicken wire, that way mice and squirrels will be put off. There are two great ways to repel slugs and snails without having to poison them. Putting down slug poison can harm other animals and is inhumane but if you scatter some totally organic crushed egg shells in your plant pots, slugs and snails will be deterred and the calcium in the egg shells is good for the soil. A second way to repel slugs is to attract other animals to your garden such as amphibians and birds, which are their natural predators. A wildlife pond or log pile will be beloved by amphibians and bird feeders, bird baths and bird boxes will attract a variety of birds to enjoy your garden. In summer, particularly on warmer days try watering your plants in the evening so they have time to absorb the water before it is dried out by the sun. Midday, morning and afternoon on hot days is not an ideal time to water as the sun can evaporate it faster than the plants can drink. 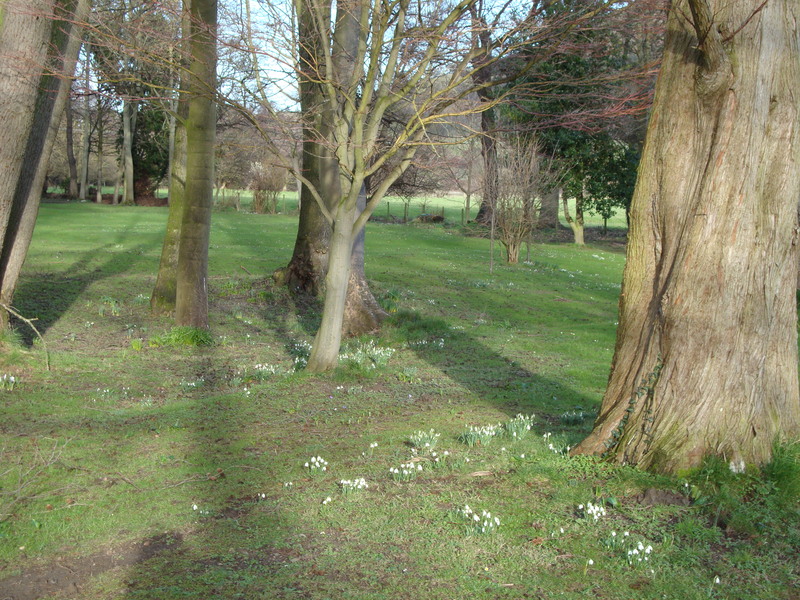 If you leave empty spaces in your gardens hardy weeds will naturally fill so try not to fear overcrowding and plant flower bulbs in all gaps even if they bloom at different seasons to prevent weed taking root. Most of us store compost in the corner of the garden as we feel it is unsightly but if it is too hidden away you will forget to use it, try storing it out in the open as it will prompt you to make better use of it for your plants. If you love recycling and reusing try making the most out of water you use to boil vegetables as this water will be rich with nutrients. If you leave it to cool you can water your plants with and give them an extra boost but be sure it has fully cooled before doing so. Grouting is a skill that is not just for those familiar with DIY. If you have a tiled shower you will probably need to redo the grouting at some point thanks to the damp. Mould and mildew are more common in these areas of the house and if not successfully cleaned off regularly you can end up with permanent stains between your tiles or worse, water can start to seep through if the grout is so old that it has become loosened or cracked. Grouting can seem like hard work if you are not fond of DIY but if you follow this simple how to guide it will be a breeze. First things first, before you get stuck in with the grouting, it is important to use the right grout. You need a high quality product to ensure a professional looking finish easily that will also last as long as possible meaning you have re grout less often. A grout job needs to look attractive but it is also important that it is robust and durable. 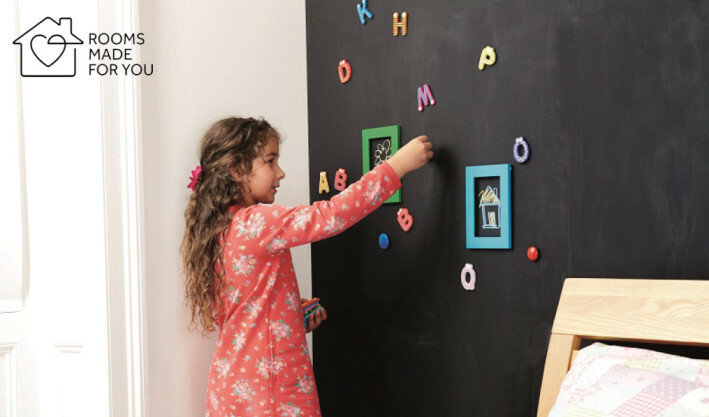 Dunlop is a fantastic, reliable brand of tile adhesives and grouts. They have a great range of grout including wall grout, flexible wall grout, floor & wall grout, flexible floor & wall grout, anti-mould grout with microban and ready mixed grout with microban. If you head to your local builder’s merchants in North Wales they should have an extensive stock of this fantastic grout. Be sure to ask which is the best grout for your job as the different varieties perform better in different environments. Step 1: Mixing Grout – The first phase of a successful grouting job is mixing your grout until it has a nice even colour and consistency. Try not to get your grout too thick or thin in its consistency. If your grout mixture is very thin it may be unsuccessful at adhering the joints but if it is too thick you will find it very hard to spread. Step 2: Spreading your Grout – This is where the use of your grout flat comes in. Simply hold the float at about a 45 degree angle then spread your grout across your tiles. Using a sweeping, arching motion will help spread it evenly. Be sure to press into all joints so they are adequately filled and pack the mixture in to avoid any gaps. Step 3: Remove Excess Grout – To remove excess grout, just take your grout float again at a more sever angle, about 90 degrees and sweep across the area you have previously grouted. Removing excess ensures a neat and attractive finish. Your grout will soon start to harden. Step 4: Cleaning – The first step in the cleaning process is to gently wipe your newly grouted tiles with a damp sponge without pulling out your grout work. If you notice a slight hazy quality to your freshly grouted tiles you should buff them quickly with a dry cloth to return their shine. Every brand of grout is slightly different to be certain to read the instructions, particularly concerning the amount of time to leave your work to dry before you add a sealer. 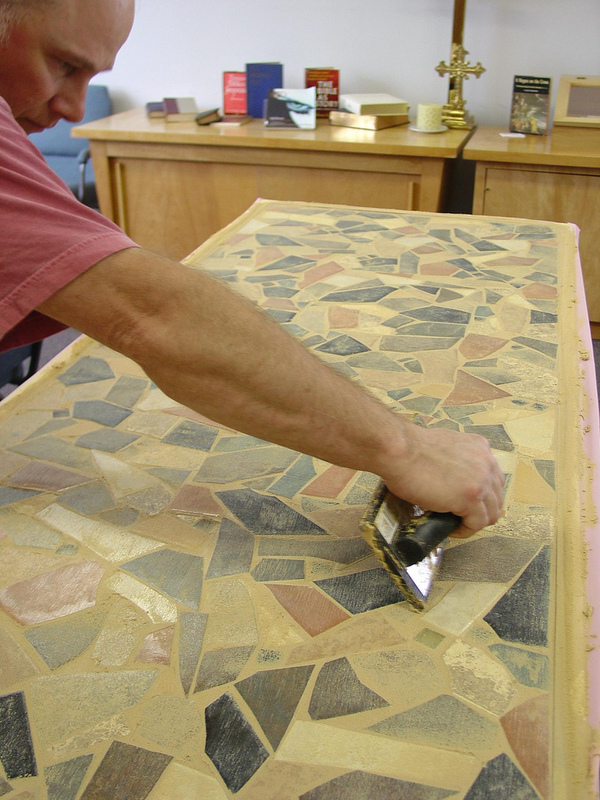 Step 5: Sealing – Once your grout has properly dried you can use a paintbrush to apply sealer. Clear away any smeary marks before it dries. After you have completed the sealing process, leave your handiwork alone for at least 24 hours. Step 6: Caulking – the process of caulking means to seal joints. Caulk can also be used as an expansion joint. This is useful because floor tiles particularly can change in different weather conditions. Caulk is particularly useful in wet grouting areas like the bathroom tiles. If you follow these easy instructions, grouting will not seem like such an imposing chore but a quick and easy DIY job. 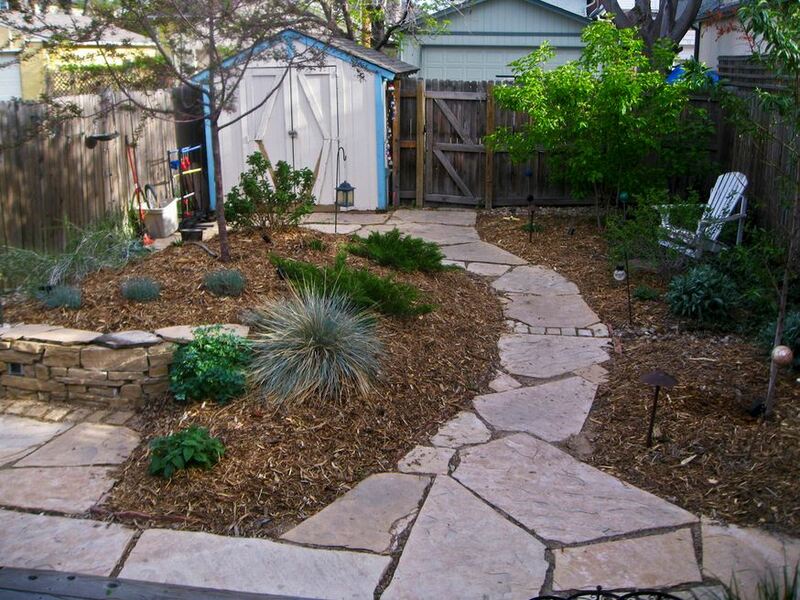 If you are looking to radically change your garden space there are plenty of options. Two of the biggest are to add lawns or paved areas. Although these two are opposites they both create a different attractive aesthetic effects. Some of the most beautifully landscaped gardens are ones that combine different styled spaces and different areas dedicated to lawns, decorative gravel and paving. If you are looking to add a patio of paved area to your property click here for our helpful paving how to guide. If you are looking to brighten up your garden with a new lawn you can save money by laying it yourself. It is a task that can be carried out by anyone with some careful planning and determination. Here is a helpful guide on how to proceed. First of all, you need to choose the landscaping materials you’ll use. You should choose the topsoil according to its and your soil’s quality. For example, if you have a low site quality or you aren’t sure about it, you should get highly fertile topsoil with a fibrous base. As for the turf, it should be very dense to obtain better results. 1. It’s important to prepare appropriately the ground. You can hire a rotavator to achieve this goal or you can turn over the soil with basic hand tools. Either way, the soil must be screened as much as possible because larger stones etc. may impede drainage. 2. Now that the base ground is ready, you need to distribute the topsoil. While you’re deciding the thickness, you should keep in mind that it will compact later. If you notice an area with low soil quality, pile more soil and when it has filled up the site you have to level it out as much as possible. You can use a piece of spare timber, for example. After that you can trample down the areas of weakness by walking across the site. It can be also useful to jump on the spare timber you used before to both level and compact your new soil. 3. Before you lay the turf, you’ll have to water the topsoil to make it moist and lightly rake it so they can bind. Abut the top of the turf tightly to the one above it to ensure there is no gap and then slowly roll out the turf. Another person needs to hold onto the top of the turf to prevent it from moving. You can also use the piece of timber to make sure that you’re not kneeling on levelled soil. 4. Initially you may want to cut out the turves to reduce wastage during the laying but the real shaping should be the last thing to do. The turves should now be lightly pressed down to connect with the soil (for example, you can hold vertically a rake and press against the turf, but don’t use a roller on it while it’s new). You should water your new lawn very often and keep off it for approximately three weeks; if you have to walk on it, try to use a plank. Don’t forget to mow the turf regularly – you can start to mow a week after laying it. 1. 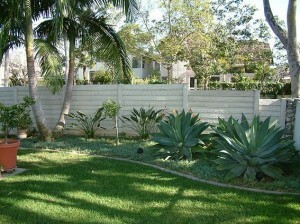 You should have a clear area where you will erect the new fencing so the first step is to remove the old fence. If the old fence posts are still standing, dig out the first and last posts of the fence run and cut the other posts as low to ground level as possible. Concrete posts can be reduced to the ground level by breaking the base of each post using a sledge hammer and using a hacksaw to cut through the steel. 2. Mark out the fence run with a line or string between the first and last post positions. Hold the first post against the line and make sure it is vertical using a spirit level and make a mark on the ground where the hole needs to be made. 3. If using 4×4 inch posts, make the hole 12 inches square by 2 feet deep; if using 3×3 inch posts, make the hole 9 inches square by 2 feet deep. 4. Place the post in the hole and fix the fence panel. 5. Now you should mix the concrete for the fence posts. Using the wheelbarrow and shovel, mix the cement and ballast together whilst dry, then add the water gradually and mix well. 6. Check the vertical position of the post against the line you set up earlier. Throw in a shovel full of concrete. Compact the concrete and then check the level and position of the post. Throw in another shovel full of concrete and compact. Repeat this process checking the post with a spirit level constantly and bring the concrete up to just below ground level. 7. Once the second post hole is ready, drop the post in and nail the panel before you begin to add the concrete. 8. Repeat the procedure for the remaining posts and panels. 9. The last step is to mark and cut the fence panels to size making the cut panel a few millimetres narrower than the gap size. Then remove the edge battens from the off-cut using a small pry bar and trim the staples flush with the batten. Finally, replace the edge battens with woodscrews of the correct length. Head to your local Builder’s Merchants in North Wales and enquire about using a cutting service. If they have a timber yard they may well be able to cut your panels to the correct size for you. If you are new to DIY you can avoid the headache of messing with concrete by buying spike or bolt format post supports. This will enable you to put up a fence much faster and save money. Ask your local Builder’s Merchants in North Wales which type of post support will be right for you. 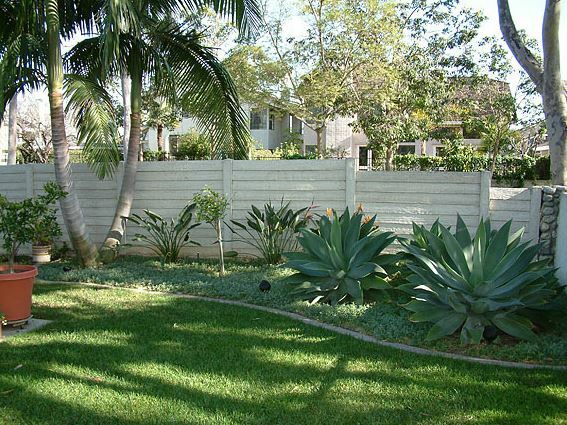 It will depend on where you want your fence to go. Hints and tips: make the bottom of the hole flat, you can drill pilot holes to take the fixing nails to prevent the fixing batten splitting, fix the panel so the top capping is an inch below the top of the post. Block Paving looks great on a patio, for a driveway or a garden path. Paving is clean, neat and gives your outdoor spaces a professional look. There are so many different choices when it comes to paving depending on your paving slabs, their colour, texture and size. Laying your own block paving can save you money but we do not recommend it for a DIY novice. If you have had some experience in DIY before be sure to follow instructions carefully and if you are unsure consult your local builder’s merchants for more details before embarking on the project solo. The below is merely a guide please consult your local builder’s merchants for specific amounts of materials required and for detailed instructions and best methods. Materials and tools you will need: 1 spirit level, bricklayers tools set, timber offcut (just the one), a plasters float, sharp sand, concrete and mortar, edging blocks, angle grinder, fine dry sand, a rubber mallet and of course your chosen block paving. You can get all these products for great prices from your local builder’s merchants in North Wales. Preparation: Before beginning you need to prepare and excavate the area. Always have a detailed plan in mind before you break the ground. Be sure you know exactly how many paving slabs you will require and the equivalent concrete and mortar. Draw a detailed diagram before you begin and be sure of the shape you want your paved area to be. It is best to have more slabs than you need so you can cut extras to the correct shape for the edging slabs. Make sure you know where all the gas, electric and TV cables are before you start excavation. If you are unsure how deep to make your excavation the standard typical depth for a domestic driveway is usually 200mm-250mm. Bear in mind this is based on a 100-150mm sub-base, a 40mm sand bed and paving blocks of 50mm. Always check the depth of your paving blocks. Before you even begin laying paving you need to lay a sub-base of concrete. You must spread, level and compact this bas a minimum of 100mm and allow it to dry. Try to make sure there are no voids and use sand to fill any voids. To Lay a Retaining Edge: When your sub-base is dry you need to lay your edging blocks on a bed of mortar. Use your spirit level and builder’s line to make sure the blocks are level and correctly aligned. Use the rubber mallet or similar utensil to make sure the blocks are pressed down firmly. Continually use the spirit level to check for blocks being level with the string line. To keep the edging blocks firmly in place in can be beneficial to build up extra concrete around their outer edge. Be sure the concrete has completely hardened before moving on to the next stage. It may take up to three days to be properly dried. Using Sand: When you are certain the edging is in place, dry and level you can cover the sub-base with sharp sand. You will use your timber offcut to help position boards at each end so that the sand is level and to the correct depth for your patio, path or driveway. Start by dampening your sand and spreading to a depth of roughly 65mm. Do not over dampen the sand. Compact your sand down another 10mm then go back and carefully loosen the top layer slightly. With your plaster’s float smooth the sand down. Laying your paving: Finally you are ready to lay your paving blocks. There are so many patterns to choose form so try laying a few dry first to check your pattern works, especially at the edges and that you are happy with the design. Always start laying from the corner. Be sure to lay them tightly against one another with minimal gaps. 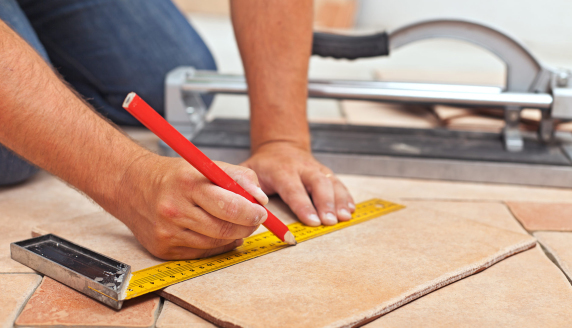 While you work kneeling on a timber board will help you not to disrupt your paving blocks as you lay them. You will probably need to cut some blocks to size so mark these using a straightedge. Lay the blocks on a firm surface for cutting and always use protective clothing. 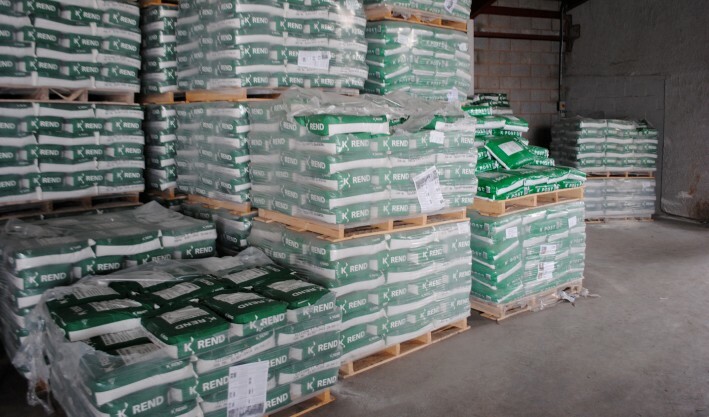 Fine Sand: Fine sand can be used to fill in the joints of your newly paved area. Brush the joints with a broom to make sure the sand gets in evenly. Press all blocks firmly and levelly at the end with a compressor. Now you have a beautiful new patio, driveway or garden path to brighten up your outside areas.